In Ludhiana and throughout India, consumer VoIP services are less widely available and less mature than are VoIP services for business. The main reason has to do with government regulations that prohibits some kinds of VoIP services consumers require. Despite the limitations, certain kinds of ILD and NLD VoIP calls are permitted (see below). Since VoIP calling is generally much less expensive than regular telephone services, you can save money if you call other people who are also VoIP users. The main thing slowing growth of consumer VoIP services in India are telecom regulations that prohibit the crossover of voice calls from regular phone networks (PSTN) to VoIP networks on the internet (and vice versa). The exact regulations are a bit fuzzy, but the net result is that regulatory prohibitions and/or uncertainty dampens the market growth. In the business market, these limitations have been less of an obstacle because most companies are on broadband connections. As a result, it is fairly easy to create VoIP-only connections between them for voice calls. Consumers are somewhat less internet-ready and also heavy users of mobile phones, so not being able to cross over from one network to the other is more limiting. Without the ability to cross over from one network to another, the only types of VoIP NLD calls that can be made are therefore ones that both originate and terminate on VoIP devices. Since there are several types of devices that can be VoIP-enabled, including PCs, smartphones, and VoIP digital phones, you may still be able to make a lot of VoIP NLD calls. So, if you make a lot of NLD calls and they are to people who are tech-savvy VoIP users, then it may well be worth the effort to get yourself set-up with a VoIP phone service of some kind. Once you do, then you can save youself a lot of money because this type of VoIP calling is generally completely free. VoIP calls for domestic long distance is somewhat restricted because voice calls are not permitted to cross from the regular phone network over to the internet or vice versa. Below are the various types of possible NLD call types and whether or not they are allowed in India. 1. VoIP voice call originates and terminates on VoIP-enabled device. This is the only type of VoIP NLD call that is permitted in India - you need to have VoIP-enabled devices at both ends of the connection. Devices that can be VoIP-enabled: a PC, a smartphone, or a VoIP digital phone. 2. Voice call originates on a regular India landline or mobile phone, but terminates on a VoIP-enabled device. This type of VoIP calling, referred to as 'VoIP dial in' calling, is not allowed in India because of the 'no crossover' rule. Note, if you are using a VoIP-enabled smartphone, then see #1 above. 3. VoIP call originates on a VoIP-enabled device, but terminates on a regular India landline or mobile phone. As with #2, this type of VoIP calling, called 'VoIP dial-out' service, is also not permitted in India. As above, if you dialing to a VoIP-enabled smartphone, then see #1. Check our VoIP provider listings (buttons below) to find companies offerings these types of services. Inbound international VoIP calls to India can be made from most any country worldwide using a variety of service providers. Inbound calls to India are perfectly okay as long as they fit into one of two categories. 1. VoIP call terminates on a VoIP-enabled device in India. Inbound calls that terminate on a VoIP-enabled device in India, regardless of where or how the call originates, are legal and pose no problems. 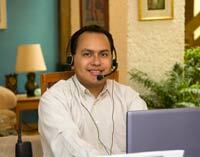 A large number of VoIP providers offer this type of service. 2. VoIP call terminates on an India landline or mobile phone. You can also receive inbound international VoIP calls on your regular phone - as long as the call is handled correctly as it enters the country. The VoIP call can originate from any type of VoIP connection. Outbound international VoIP calling is sort of like inbound calling in reverse - except only in very specific circumstances is the second option (originating a call on a regular landline or mobile phone) allowed. 1. 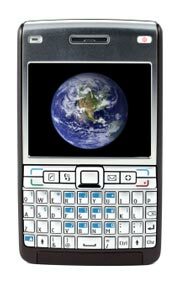 VoIP call originates on a VoIP-enabled device in India. Outbound international calls that originate on a VoIP-enabled device in India are legal and pose no problems. There are any number of VoIP providers who offer this type of service (see buttons below). Depending the VoIP service provider you use, you can make outbound calls to other VoIP-enabled devices or to regular landline or mobile phones. 2. 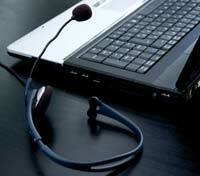 VoIP call originates on a regular landline or mobile phone in India. In general, you can't originate VoIP calls on regular phones in India - except when you use a particular kind of VoIP service that we call 'calling card VoIP'. With calling card VoIP, you access the provider's VoIP network through an access code dialed from a regular phone. We are aware of only 1 provider that offers such service (FreeCallPlanet), but there may be others.